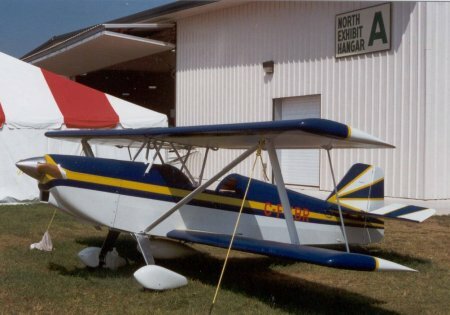 C-FYBR the prototype Acrolite was first flown to Oshkosh in 1996 as a finalist in the Aircraft Spruce design contest. It was flown there again in 1997. This was a flight of 684 kilometres / 425 air miles one way. One stop was made at 241 kilometres / 150 miles in Duluth Minnesota, for Customs clearance and fuel. While it was possible to make the remaining 443 kilometres / 275 miles without stopping, because of the possibility of long delays getting into Whitman airport it was decided to carry an additional 18.9 liters / 5 gallons U.S. of fuel in an auxiliary tank (for a total of 52.99 liters /14 U.S. gals) located below the fuselage. Total flight time was just under 4 hours. The Acrolite 1B Biplane over Oshkosh at 5000 ft. during a photo shoot for the EAA Sport Aviation Magazine. The Acrolite 1B was featured in the February 1997 issue. 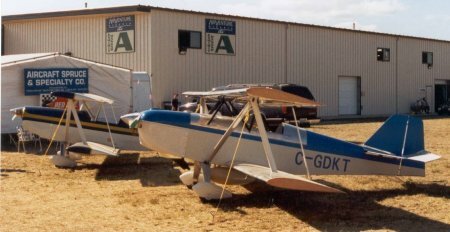 In 1998 both aircraft C-FYBR and C-GDKT were flown in for the EAA. convention. Both aircraft are pictured here in front of the North Exhibit Hanger A. Inside this hanger is the location of Aircraft Spruce's display booth. 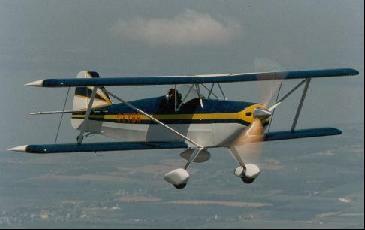 In 2005 C-FYBR and the new Triplane C-IAVT were both flown to the EAA convention. 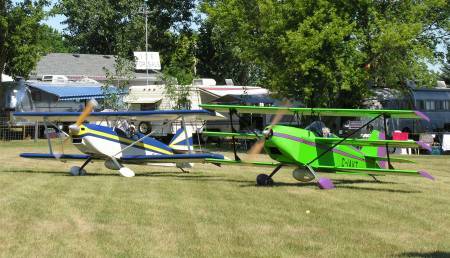 Both aircraft are pictured here in the run-up area at the ultralight field. The aircraft flew in to the ultralight runway and were tied down in front of the Red Barn. The aircraft were very well received with a lot of interest in the Triplane. At the Theater in the Woods on Saturday evening the Triplane was awarded Honourable Mention Lightplane by the EAA judging committee. An award we were very pleased to receive.